Manga is the Japanese comic book or graphic novel, with their stories of ninja, pirates, ghost hunter, world adventures, and so many more. There are some ways to read it. You can buy manga on book stores, as most people does. Or, you can read manga online and for free from online manga websites. There are so many websites who provide online manga reading, but they usually provide only reading feature, with no feature to download desired manga. For that cause, we need a software to download manga. 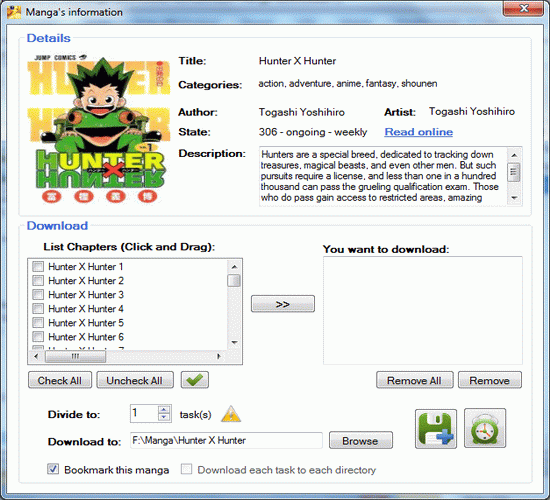 There’s one software, Domdomsoft Manga Downloader, that we can use to download manga. Note : this software need to be updated to renew its manga database, and this software is available in limited version (free) and free version. Don’t need to install, just click and run! English : TenManga, OtakuWorks (has many manga and fast update), MangaToshokan (manhwa), AnimeA, MangaReader, StopTazmo, MangaStream (high quality and fast update – only host some latest chapters of hottest manga), MangaFox (has a lot of manga), SomeManga (include SomeMango), AnimeVibe (high quality and fast update), MangaHere (has a lot of manga), MangaRush, MangaAccess, EatManga (high quality and fast update), OurManga, MangaPark (has a lot of manga), DoujinToshokan, HentaiParade, Fakku, Scio. Indonesian : BacaManga, MangaFire, MangaBaru. Chinese : MH99770, FlyLuo, 89890. Windows OS with NET Framework 2.0.